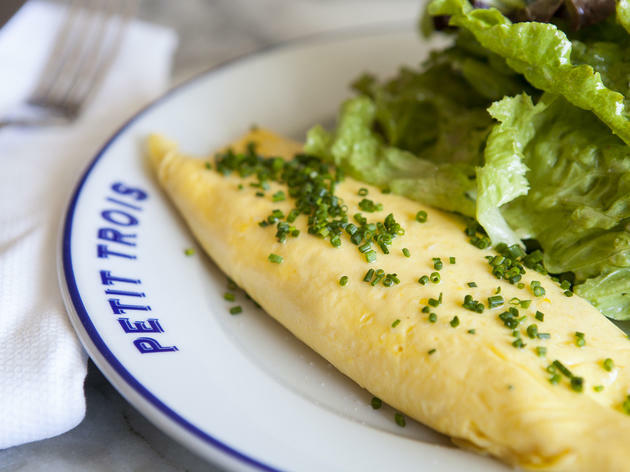 To watch an omelette being made at Ludo Lefebvre’s Petit Trois is a thing of beauty. First there is the butter, a massive pad that swirls around the pan before being flooded with whipped eggs over low heat. The mixture sits, briefly, then is taken off the stove and gently poked and prodded for minutes until it is finally folded into one uniform, buttercup-hued omelette. Oh, and did I mention that Boursin cheese is piped through the middle? 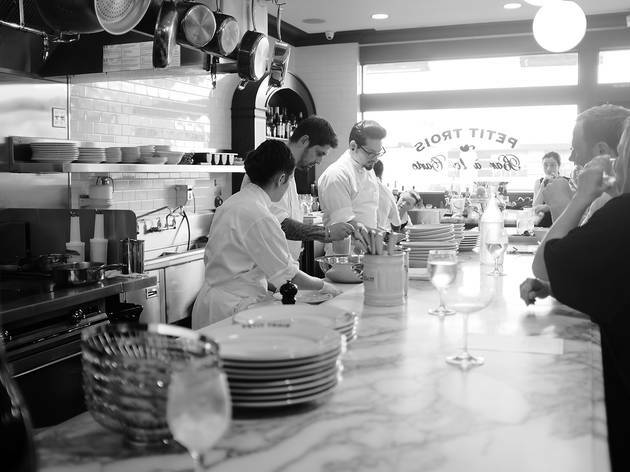 Perceived simplicity is what Chef Lefebvre aims to perfect at Petit Trois, which sits right next to his first brick-and-mortar success, Trois Mec. 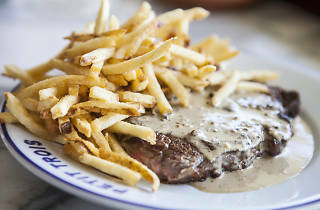 The menu is a sparse list of classic French dishes—steak frites, mussels marinières, chicken leg—and the playlist is '90s hip hop and classic rock, an unusual mix but one that furthers Lefebvre’s ethos of this being a casual French spot, a place to indulge in simple, good food without pretense. If the Hollywood strip mall exterior doesn’t sell you on this idea, the food certainly will. I was not asked how I would like my steak when I ordered the steak frites, but if I had been, I would have asked for exactly what came out. Cooked medium rare, the juicy slab arrives au poivre, slathered in the traditional sauce with green peppercorns for a hit of spice and a squeeze of lemon for acidity. The accompanying fries are fantastic. It’s a dish that, as an end product, seems so basic, so why were we astounded (as with the omelette) that it tasted that good? This was a theme that continued throughout our meal, making us question if we had just been settling all along when it came to steak and eggs. 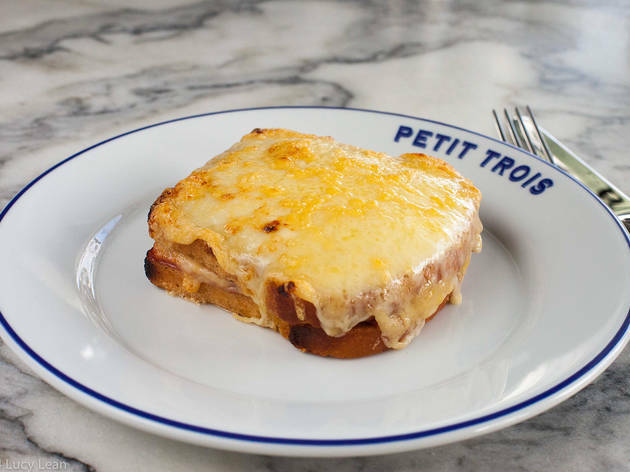 A croque monsieur, originally offered only after 10pm and now part of the full menu, is a heart attack waiting to happen (though, from a prep chef who leaned over the granite chef's counter as we ogled at the sandwich: “That’s better for you than a Big Mac.”). A mass of melted cheese sits over the top slice of bread, cooked under the broiler. The dish is comfort food, plain and simple: there is the thick, oozing Gouda; the salty slices of ham; the bread that has been soaked through with butter to create the golden toast. The real heart attack? You pay $18 for it, which led us to another existential question: Is a grilled sandwich ever worth $18? Is an omelette? What if it's the best omelette you've ever had? 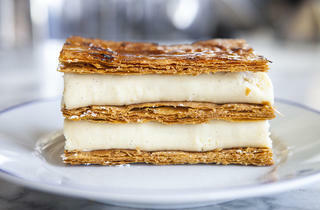 Lefebvre wants to channel the French bistros of his youth in an LA strip mall, and that's fine. But to ask diners to stop in for a "dish or two, and a drink" and then leave $70 poorer? C'est ridicule. 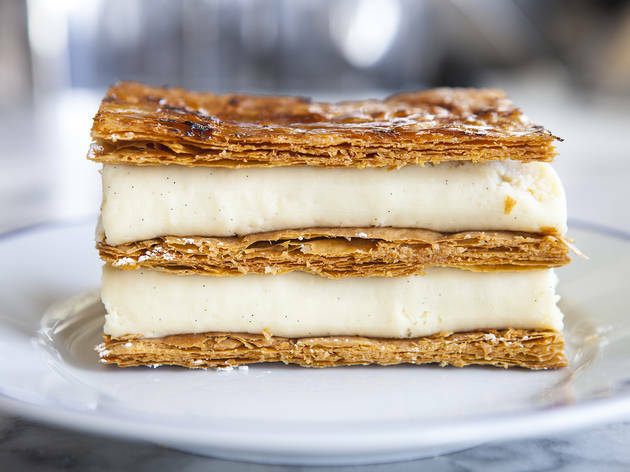 Still, whether it is a forkful of the chocolate cake drizzled in caramel sauce and a dusting of cocoa powder, or that last bit of omelette with its garlicy, peppery Boursin, there is no denying that Lefebvre has done his work here. Petit Trois is casual. It is French. And it is very, very good. 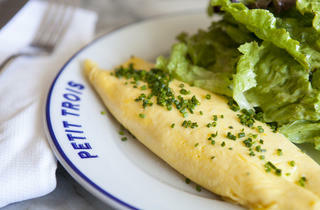 What to Eat: The omelet ($18). 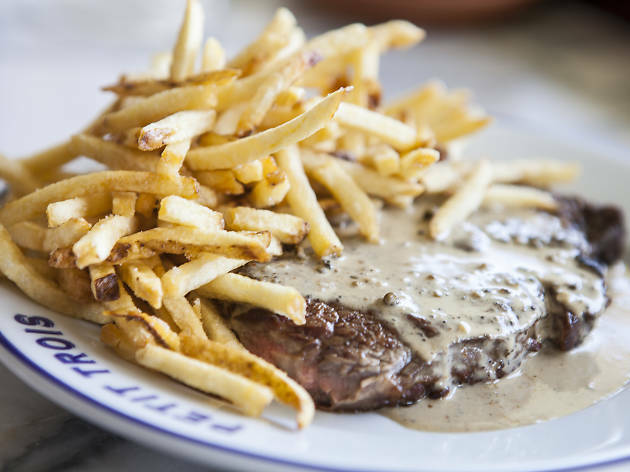 The steak frites ($36). 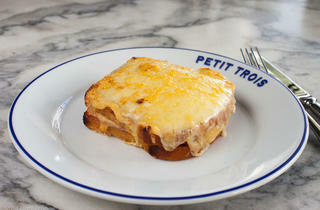 The Croque Monsieur ($18). The chocolate cake ($10). 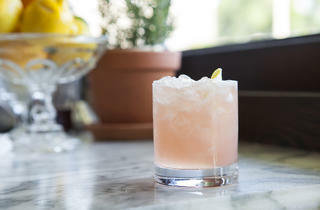 What to Drink: Despite his aversion to cocktails, Lefebvre has included a cocktail list along with a selection of wines and a few beer options. The cocktails, however, are far from the eight-ingredient concoctions we have come to expect. 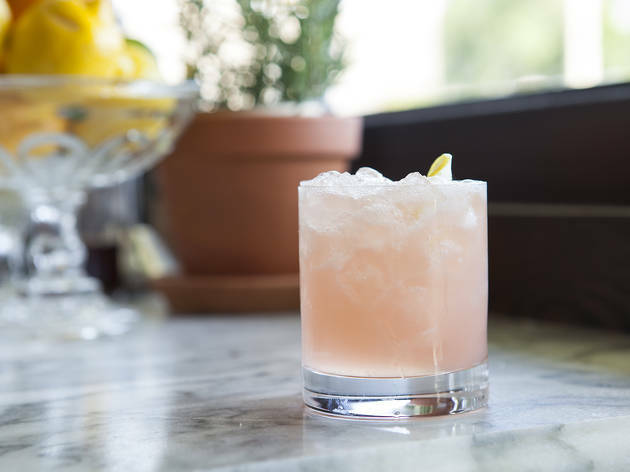 Drinks are simple, like the delightfully fresh Fleur de Mal ($12) that uses rose petal-infused vodka, ruby grapefruit and lemon to create a crisp, balanced beverage that, despite its citrus components, is neither too sour nor too sweet. Where to Sit: There are roughly 20 bar seats at Petit Trois: you can either sit facing the kitchen or facing a mirror (there are a couple smaller tables off to the side as well). Sitting at the kitchen counter—especially when they are making that omelette—is a happy distraction as you wait for your food. The downside? You can see exactly how much butter is being used. 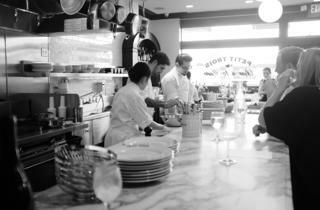 Conversation Piece: There is no tipping at Petit Trois. Instead, an 18% service charge is added to the bill. Oh, and cash isn’t allowed—only credit cards. This bistro may be casual, but it’s still Ludo’s house. Read our interview with Ludo Lefebvre here. Cozy-in and prepare to taste an omelette for the very first time--nobody makes em like Chef Ludo. It took me about five trips before I decided to try something else on the menu, like the Paris ham baguette with French butter, which is actually an off-menu lunch item, and a total pro-move. The pea tartine ( seems to be a seasonal special) is one of my favorite dishes of all time, anywhere. Best enjoyed when there is only two (bar seating only), it is one of my favorite date-night spots in LA. Though it can get crowded (and there is limited seating), I've been many times, and never waited more than ten minutes. Media is no longer visible.